While last year's revival of Xcom: Enemy Unknown was ultimately a successful one, some rough edges, limited research paths and repetitive maps held it back. 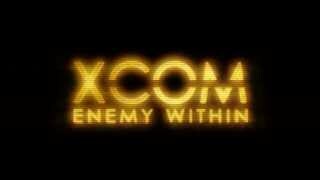 One year later, and Firaxis have released the first major expansion for the game Xcom: Enemy Within, featuring a new resource, combat with humans, new maps and invisible flying squid things. This is a kitchen-sink style of expansion, as rather than forge a separate story arc, Enemy Within pretends the main game never happened and simply adds a bunch of stuff to the original campaign. While this expansion probably won't make any new fans of the title, those looking for a reason to go back for another run through the game will find one in Enemy Within. The first and most apparent addition to the Enemy Unknown formula is a new resource known as Meld. Meld can only be collected during missions, where it takes the form of canisters which explode after a set number of turns if not collected by one of your soldiers. These canisters are scattered randomly throughout levels, forcing you to venture forth somewhat less cautiously than you might otherwise in order to ensure you obtain the substance before it detonates. Once you manage to accumulate enough of the stuff, you can use it to upgrade your soldiers in a variety of ways. There are two main paths you can take with Meld, one that sees you granting biological improvements to your soldiers which might have them regenerating health, turning invisible and aiming with greater accuracy. The buffs offered by these augmentations are mostly rather mundane, providing similar bonuses as various pieces of equipment. It is fun making a squad of super-soldiers who exude even more badassery than previously, but the passive nature of these upgrades feel like a missed opportunity. The second use of Meld is somewhat more interesting, allowing you go turn your soldiers into cyborgs who can be placed into heavily armored mech-suits. These mechs gain access to some interesting weapons right away like a flamethrower and kinetic-strike module (you can use your imagination for that one). They can also take a lot of damage, but cannot be placed in cover. The impact Meld has on the campaign isn't huge, but it does offer some good risk-reward elements and introduces further research options into the mix. Outside of these soldier augmentations, you will be granted medals which you can award to your soldiers, providing small stat boosts. Apart from this, a handful of new items can be obtained by researching some of the new alien types, such as ghost-grenades when create a sort of invisibility cloak around impacted soldiers. One side effect of the Meld-fueled buffs to your forces is that the game becomes overall easier. The new aliens introduced don't really offset this effectively, since they aren't very difficult to deal with. Mechtoids are basically the alien equivalent of your mechs, and can do some decent damage, but since they are such large targets I found myself destroying them rather easily. Another new alien turns invisible and pops up eventually to strangle one of your soldiers who is separated from the others, but does very little damage and once it re-appears is no longer a threat. One of the most welcome additions is the slough of new map environments, ranging from crumbling buildings to the classic farm setting that somehow didn't make it into the base game. Many of the new maps offer atmospheric conditions to do battle with aliens, serving to ease feelings of repetition later in the campaign. New mission types help spice things up as well, in particular encounters with the mysterious human Exalt operatives. You learn of the existence of this group early on, and periodically will select one of your soldiers to go on a covert operation to infiltrate their organization. Several days after sending the operative out, you will complete an extraction mission. These are nicely varied and have you facing off against human opponents rather than aliens. The Exalt troops behave differently from Aliens, exhibiting more defensive behaviour, healing each other and using rocket launchers against clusters of troops. These missions usually involve hacking some terminals or defending a couple of zones, though they are distinctly less challenging than some of the tougher alien encounters. Having to keep your unarmoured, pistol-wielding operative alive throughout the mission is a nice twist though. The only mission type that serves to ratchet up the difficulty are base defense missions. These give you access to a random assortment of troops from your barracks, resulting in a rag-tag assembly of rookies and experienced soldiers who must fight off some very heavy alien forces. I found these missions frustrating as you don't get to choose a specific squad with abilities that complement each other, instead being forced to deal with what the game gives you. In one mission I found myself facing off against four alien Mechtoids with a handful of rookies and some experienced soldiers using very basic gear. The losses I took during these missions felt somewhat cheap given the randomness of the units I was able to use. The concept of base defense missions is sound but the execution here is questionable and might ruin your campaign if you are using Iron Man mode which prevents you reverting to older saves. One side effect of the new mission types is that there seems to be more missions in general. Whereas in the base game it seemed entire weeks would go by without fighting extra terrestrials, here missions pop up almost every other day; on several occasions multiple missions would be made available on the same day. The impact of this is mixed, as having more missions means your soldiers are more often wounded and your equipment stretched thin, but it also means your troops have more opportunities to increase in rank and you have more occasions to reduce panic. You will also have more items to sell on the grey market, allowing you to spend more money on equipment and facilities. Multiplayer has been updated as well, although it remains a flawed experience. New maps, units and items add much needed variety to the competitive mode, although the various problems the multiplayer had before remain here. The player who goes first has a distinct advantage, being able to get a head start on occupying the most desirable positions early on. Lag and desynchronization remains common, with turns being skipped and units refusing to move for no apparent reason. It can still be fun to face off against a friend, but this mode isn't worth taking seriously. Although the tweaks and additions may individually be underwhelming, they breathe enough life into the game that it does stave off the repetition you might have felt when going through Enemy Unknown for a second or third try. The turn based gameplay remains compelling, with fist-pumps following a squad-saving critical hit and sinking frustration stemming from missing an important shot that had a high probability of connecting. If you want more Xcom but feel burnt out on the base game, Enemy Within will likely be just what you were looking for. However if you didn't enjoy Enemy Unknown or grew tired of the unpredictable gameplay it probably isn't worth the investment. The game looks and sounds the same as it did last year, though some maps have nice added effects like snowfall and visual glitches are less common. The gameplay is much the same as before but now features more diverse options for developing specialized soldiers, resulting in reduced difficulty overall. New features are piled onto the existing campaign with mixed results. The same campy storyline now involves combat with human opponents and features a new resource. No changes to the format, just new maps, weapons and units. Desync problems abound and the player who goes first retains a distinct advantage. Glitches are less common in singleplayer, though desync and bugs remain an issue in online games. Those tired of Enemy Unknown's formula will not find compelling improvements or changes here, though fans will find enough new content to merit another go at vanquishing the Alien invasion.